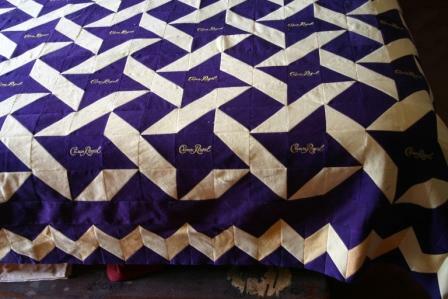 Here are pics of my Crown Royal quilt top. I want to purchase wide quilt backing and am looking for color suggestions. Also, since the top is flannel would it be better to use cotton instead of flannel backing so it won't be quite so heavy. That's what I am thinking. Please help me decide. flannel? is that real Crown Royal bags or purchased fabric? Just wondering. I'm making blocks with Nu-suede and think I will have to put fusible interfacing on the back of them. I would think cotton backing would work well with your quilt. maybe a print since you have dark and light areas to quilt in. Great quilt!!! Marshall's Dry Goods has very good prices and excellent customer service, or at least that's been my experience. Great looking top. I agree try Marshall's. 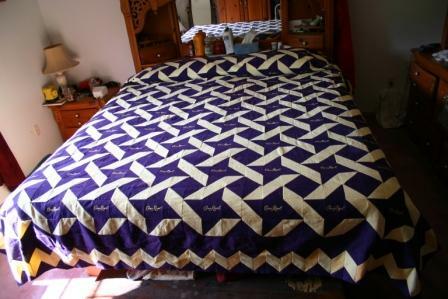 Beautiful quilt!!!!! Edited to add that your quilt came out very pretty. Personally, I'd go with cotton because of the weight, but if you need further flannel resources I have discovered a site called Flannel World (which makes me giggle, a bit). I haven't ordered from them yet, so I cannot attest to their serveice etc, but they have a good selection! You did a wonderful job on your Crown Royal top. I would check out wide backs in both cotton and flannel and go with the colour that matches the top the best. If you are machine quilting than you could use flannel or cotton. Depends on how heavy you want it to be. Yes it is real bags, and I had a bunch that we had indeed emptied ourselves over a span of a number of years. However, once I determined what pattern I wanted to use I bought some in bulk off ebay to supplement my collection. I love all the responses, but what color of backing do you think I should use? Your quilt top is BEAUTIFUL. fabric.com has a wide variety of wide backing fabrics- regular cottons and flannels- and free shipping at the $35 point. I've been buying almost all of my backings from them for over 10 years...great choices- good prices- good customer service. I like this purple for the back. I like to be able to match top and bottom threads and still be able to hide as many of my flubs as possible! I would suggest a purple and white floral that has green leaves in it and back it with that. Love, love, love this quilt. Crown Royal gold for the back! Maybe with bits of purple and white/cream. This is one of the better CR bag quilts I've ever seen; way to go! Personally, I would go with something closer to the light color in the quilt. If you wanted to go with flannel, could you use a lightweight/thinner batting? I like for my backing to be a surprise, something that you would not expect when looking at the top. I would use some type of a small print in a color you would not expect. Whether or not to use cotton or flannel depends on how heavy a quilt you want and like. You probably have a larger choice of material in cotton. The quilt is beautiful. I didn't notice if anyone mentioned the WideBacks site. When I started reading thought your question was about color. My advice is pick a color to match or blend with whatever color you want to quilt it in. Hides any boo boos. I'm expecting a customer to bring me crown royal bags for a quilt he wants. I love your choice of design.